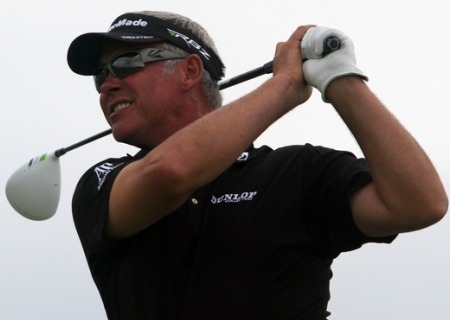 Darren Clarke showed his fighting qualities in Paris. 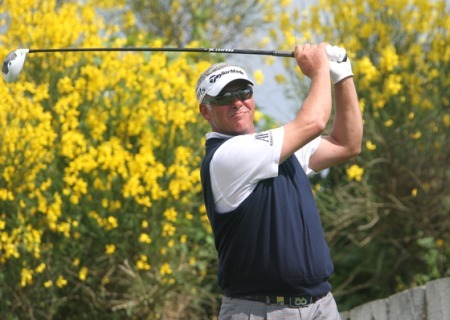 Photo Jenny Matthews/www.golffile.ieWith his wraparound shades giving him a forbidding look, Darren Clarke looked every inch The Terminator at Le Golf National when he bounced back from back-to-back sixes to birdie two of his last three holes and open with a one under 70 in the Alstom Open de France. The Open champion will not be doing somersalts over a 70 but having made his first cut of the year in the Irish Open last week, his late rally was another positive sign just two weeks before his defence of the Claret Jug at Royal Lytham and St Annes. As Sweden’s Christian Nilsson fired a six under 65 to lead by a stroke from Thongchai Jaidee, Gary Boyd and Matteo Manassero, Clarke finished his day tied for 21st alongside the likes of Lee Westwood and Shane Lowry as Graeme McDowell posted a 72, Peter Lawrie 73, Damien McGrane 74 and Ulstermen Michael Hoey and Gareth Maybin a brace of 76s. Tight off the tee and lined with thick rough, the 2018 Ryder Cup venue proved to be a punishing test for anyone failing to find the fairways. Having started on the back nine, Westwood was four over par through six holes before rallying with a birdie at the 16th and four birdies in a homeward 32 to post a one under 70. Westwood didn’t bother taking off his shoes to standing in water to play his approach from the edge of a lake at his final hole, the ninth, as he made a spirited comeback in his last event before the Open. Explaining why he rolled up his trousers but left his shoes and socks on, Westwood recalled how Thomas Levet broke his leg jumping in the lake at the 18th following his win last year. Clarke, 43, also made a visit to water near the end of his round. Two under with five holes to play, he bogeyed the par-five 14th before coming up short in a lake when playing his approach from the left rough at the 15th to card a double bogey six. Now one over, Clarke might have buckled on another day but he almost won a car when he came close to aceing the 175-yard 16th and followed a two from just five feet there with a rare birdie from 25 feet at the terrifying 18th. Clarke is keen to build his confidence following a nightmare year on the course since he captured the Open nearly 12 months ago. Forced to miss the US Open and take a month off with a niggling groin injury, he showed signs that he is close to regaining some of his old form and enthusiasm after a year that has been busy and problematic both on and off the course. The Portrush native has travelled around the world as Open champion. And while that has, no doubt, brought financial benefits, he has spoken of tough times off the course. That brings back memories of his manager’s assertion last year that his client was suffering financial hardship though Clarke has yet to elaborate on exactly what has been troubling him away from the game this season. Like McDowell, the Open champion is playing his final event before the Open and rather than playing next week’s Scottish Open at Castle Stuart, he will be making a visit to the Junior Open at Fairhaven. 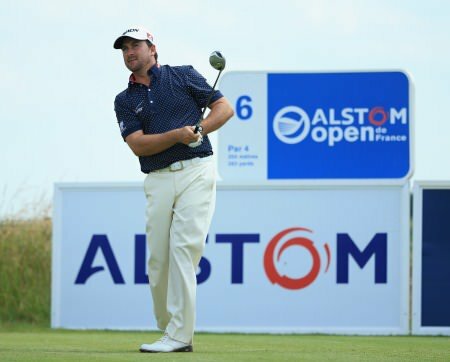 Graeme McDowell needed two late birdies to get back inside the projected cut mark after an unsteady start to his bid for a third successive Alstom Open de France title at Le Golf National. Darren Clarke was undone was a quadruple bogey eight in Paris. Photo Jenny Matthews/www.golffile.ieWho is Ireland’s best bet for the Open? If Padraig Harrrington can regain some confidence in his green-reading in the Scottish Open next week, it could be the Dubliner. Graeme McDowell in Paris on Saturday. © Getty ImagesWin or lose the Alstom Open de France near Paris today, Graeme McDowell will turn up at Muirfield for The Open as one of the men to beat.